When did the community open? One bedroom suites start at $2906.00. The monthly rent provides 24-hour security and in house medi-alert system, all utilities except for your personal telephone line. A continental style breakfast is served daily between 8-10 am in the Bistro and lunch and dinner served daily in the Dining Room. Weekly Housekeeping services are provided which include laundered linens and towels. There is secure underground parking for vehicles and scooters. There is an annual rent review in October. Any rent increases will begin February 1 of the following year. What appliances are found in the kitchens of the suites? Each suite includes a stove and fridge, and a space for a microwave. Can I have guest for meals? How much do guest meals cost? You may certainly have guest dine with you for lunch and/or dinner. The cost for lunch is $9.00 and dinner $14.00. Sunday brunch is $12.00 and Sunday dinner $17.00. We do offer children’s pricing. Can I have guests stay in my suite? You are encouraged to treat Athens Creek as your home. If you wish to have a guest stay with you in your suite that is your choice. Family and friends are always welcome. Is there a guest suite? 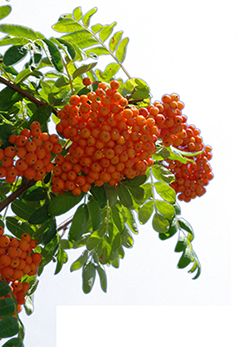 What is the cost? Athens Creek Retirement Lodge does have a guest suite. The private suite offers 2 bedrooms, 2 bathrooms, full kitchen, a spacious living room, and patio. Air-conditioning and a fireplace provide comfort for the Okanagan weather. It is rented for $90.00 plus GST per night to family and friends of our residents. Athens Creek Retirement Lodge does allow small dogs on the main floor and indoor cats throughout the community. There is a pet agreement to be signed and $500.00 deposit for those residents that have pets. We require that all pet vaccinations are kept up to date. Is there a Wait List? Is there a cost to be placed on the waiting list? What happens if you decline a suite when one is offered to me? Athens Creek Retirement Lodge does have a Wait List. There is no charge to be placed on it. If we call you and you decline a suite, you will remain on the list and will not lose your place. Is there a suite deposit? How much is it? Once you have chosen a suite and decided to make Athens Creek Retirement Lodge your next home, there is a $500.00 deposit to hold the suite. After you have moved in, we will hold the deposit as a damage deposit. What type of on-site Amenities are offered? 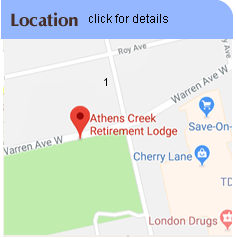 Athens Creek Retirement Lodge offers: Recreation Room; Lounge; Bistro; Community Patio; Bocci Courts; Putting Green; Exercise Room; Library; Hair Salon; Laundry Rooms for personal laundry and Underground Parking. What type of activities and entertainment are provided? Are there organized day trips? Athens Creek Retirement Lodge offers a multitude of activities and entertainment options for residents to enjoy. Entertainment is brought in on a regular basis – music, dancers, school choirs, and short plays. We celebrate all the holidays and have monthly birthday parties. There are regular card games including a poker night. There are two Bocci Courts outside and a Recreation Room where the residents meet to play pool, Shuffle Board, Wii Bowling, Bean Bag Baseball and cards. Happy Hour is a favourite for socializing several times a week. Scooter Picnics, Wine Tours and Casino trips are routinely organized and all residents are encouraged to join in the fun! We do not have a community bus and have no plans to purchase one. Are the meals prepared on-site? Yes our meals are prepared on-site by our Red Seal Chef and kitchen employee care partners. Can we have Home Care brought in to assist our loved ones? Yes, as Athens Creek Retirement Lodge does not provide care. We encourage residents and their families to establish a Home Care relationship to enable the resident to maintain their optimum level of health and security. Home Care may be accessed through Interior Health or private Home Care agencies but must be organized by the resident and/or their family. What happens when I/my parent requires Residential Care? The safety and security of our residents is our number one priority. Therefore, once a resident’s care needs become greater than can be safely addressed at Athens Creek Retirement Lodge, the Wellness Manager along with the General Manager will coordinate with the resident and his/her family to facilitate access to Interior Health and/or Residential Care.